Clovis, California January 19, 2017 – Recent storms have brought much needed rain and snow to the Sierra Nevada in the last few weeks. These storms have also created a significant amount of runoff, swelling rivers and creeks beyond their capacity in many locations, and causing recent evacuation notices to be issued for several areas. These notices have since been lifted. With the ground already saturated, road travel requires additional caution, as the potential for additional flooding, mud and rock slides, washouts, and falling trees still exists. Several roads on the Sierra National Forest have sustained damage due to these recent storms. The McKinley Grove Road located on the High Sierra Ranger District which is seasonally closed, has had a 65ft section of road wash out. Efforts have been made to repair this damage. Numerous other roads including Dinkey Creek Rd have seen damage ranging from washing out, mud & rock slides, and downed trees blocking the roadway. The following is a list of roads that the Sierra NF has closed for public safety due to damage, their impassability, and to avoid damage from further use.  McKinley Grove Rd (11s40) – Only open to PG&E and forest crews, as damages are assessed, and repaired.  Garnet Dike Rd (12s01) – Closed due to rock & mud slide making road impassible. For the following roads, Sierra NF crews are in the process of posting warning signs/barricades in damage areas we are aware of, to warn visitors of the hazards associated with road damage from the recent weather. We recommend extra caution when traveling on these roads, as additional damage may occur.  Beasore Rd (5s07) – Expect debris to include rocks & mud, water, pot holes, and trees down in some areas. 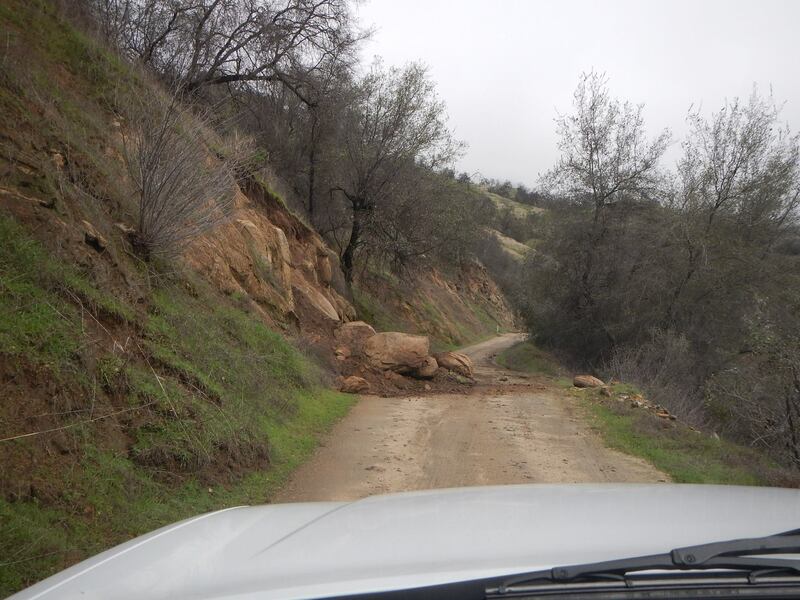  Minarets Rd (4s81) – Expect debris to include rocks & mud, water, pot holes, and trees down in some areas. The National Weather has issued another Winter Storm Warning for the Sierra as series of Winter Storms will once again impact the area. “We encourage visitors to exercise extreme caution when traveling through the Forest,” said Dean Gould Forest Supervisor. With the additional rain, wind, and snow accumulation, the risk of trees falling, increases significantly. These falling trees along with swelling creeks, rivers & streams can impact roadways, picnic areas, trails, camping spots and parking areas. “I advise everyone to check the weather before and during your visit, and be prepared for changing conditions. Current information, preparedness, and minimizing your exposure to risk are your best tools” stated Gould.  Let family/friends know your travel plans and expected return time. Cell phone coverage is limited across the Forest. For information regarding the Sierra NF, and recreational activities please contact the High Sierra Ranger District office in Prather, CA. at 559-855-5355, Bass Lake Ranger District North Fork, CA. at 559-877-2218, or the Forest Supervisors office in Clovis, CA. at 559-297-0706.